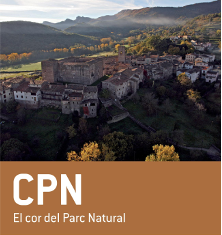 The volcanoes of Sant Marc and El Puig Roig stand near the town of Sant Feliu de Pallerols in the southern part of La Garrotxa Volcanic Zone Natural Park at the foot of the steep slopes rising up to La Salut and the cliffs of Rocalba. These two volcanoes are of interest for different reasons. Sant Marc illustrates well how a volcanic cone forms from an accumulation of pyroclastic deposits, which are visible in the former quarry on one of its flanks. Puig Roig, on the other hand, has a quarry from which basalt – a hard rock that forms as lava cools – was once extracted. The two volcanoes can be visited along a circuit starting in Sant Feliu de Pallerols that takes around two hours to walk.